It is a beautiful watch. A little bit bigger than I thought. But still very nice with jeans. Huge watch face, which I love BUT it’s too small! it doesn’t come with additional links to adjust. My son has a smaller wrist than I -adult- and it didn’t even go all the way around on his wrist! I actually put 2 fingers together and I put the watch around it. Closed the clasp. It fit tightly... Sent it for a return and I won’t even get the full amount I paid for the watch... Disappointed. 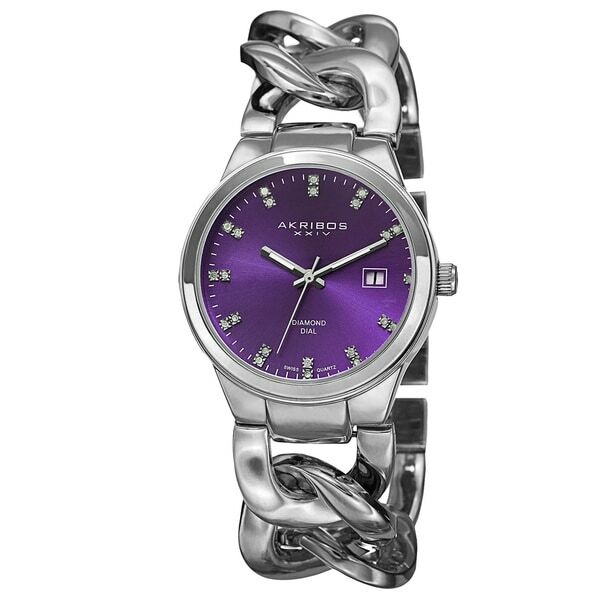 I returned this watch because the color was light purple instead of dark. Watch is beautiful but not the color I was looking for. This was a really good buy. I found it a little light weight, but it makes it easier to wear because I have a small wrist. Overall, love it. Watch did not work! Junk! Do not waste your money. Little bigger than I would like it to be! "are the diamonds in the dial real diamonds and if so does the watch come with diamond authenticity certificate"
Hello kwan, this watch features genuine diamond accents. The diamonds are not certified by an organization. Thank you for shopping with us! "how to I change and set the date on this watch?" Hi cmalphonso, thank you for your inquiry! You can change the date by pulling the crown half a click out then rotate it counter clock wise to the desired date. Hope this helps, have a great day!